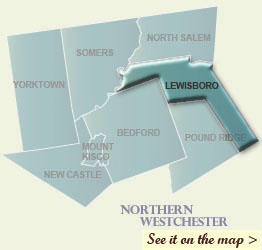 Located in the northern section of Westchester county, Lewisboro is comprised of six peaceful, bucolic hamlets: Goldens Bridge, Cross River, Waccabuc, South Salem, Lewisboro and Vista. Just a short trip from Manhattan from its Metro North station in Goldens Bridge, Lewisboro is an easily reachable destination for many outdoor activities and features golf courses, small shopping centers and plenty of hiking and biking trails. With historic stonewalls lining idyllic pastures and meadows, farmland, horse properties and many lakes, Lewisboro is a scenic country retreat just 55 miles from Times Square. Town parks, hiking trails and many nature preserves for walking, hiking and cross country skiing. Ward Pound Ridge Reservation: The 4,315-acre park is the county’s largest and features varied terrain and landscapes and miles of wooded trails with areas for picnicking, lean-to camping, fishing and cross-country skiing. The Trailside Nature Museum: Situated on the Ward Pound Ridge Reservation, it is the oldest museum of its kind in the United States and is home to a large collection of mounted animals, American Indian artifacts, educational exhibits, child-friendly interactive displays and nature-oriented artwork. Historic points of interest: the Cross River Baptist Church (c.1790); St. John’s Episcopal Church (1855); Monument Rock on Elmwood Road; Hideout Hill; Farvue Farm, home of Henry Agard Wallace, Vice President and Secretary of Agriculture under FDR; Onatru Farm; and the following places on the National Historic Registry: Mead Chapel, Peaceable Kingdom, The Homestead on Mead Street and the Whipple Truss Railroad Bridge # L-158 in Goldens Bridge.